Last Monday, I launched my campaign for a Ben Cohen 2017 Calendar. Thank-you for spreading the word by social media. Bullying is an important cause to many of us. As I wrote last week I was bullied for being gay as a child. Why did I launch my campaign for a Ben Cohen 2017 Calendar? The Ben Cohen Stand Up Foundation was started in 2012 by Rugby World Cup Winner, Ben Cohen, with a mandate "...[to] stand up against bullying regardless of to whom it happens. We support organisations and projects that help stop bullying, help those hurt by bullying and/or help increase equality and diversity." 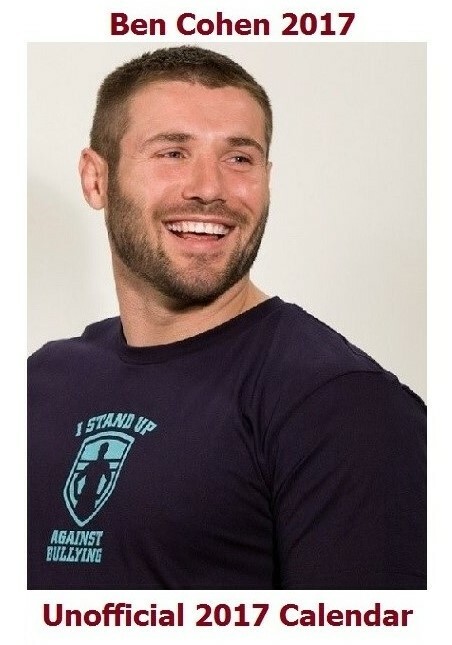 Funds are partly raised for the Stand Up Foundation through sales of merchandise such as t-shirts and Ben Cohen calendars. There was no 2016 Ben Cohen calendar and I feel that this was a lost opportunity to bring continued awareness to the Stand Up Foundation's anti-bullying work. Therefore, this week, I have created The Unofficial Ben Cohen 2017 Calendar. I hope this will send a message of encouragement to The Ben Cohen Stand Up Foundation to produce an official Ben Cohen 2017 calendar. Preview The Unofficial Ben Cohen 2017 Calendar below. See the full Unofficial Ben Cohen 2017 Calendar here.